One of my plans for this holiday, was to finish my apron, but …. something went wrong and I ended up with a Barbie-sized apron.... :-) I'm going to give smocking another try, by making a small sampler first. That way, I can practice the stitches, and I can use the sampler in workshops and demonstrations. 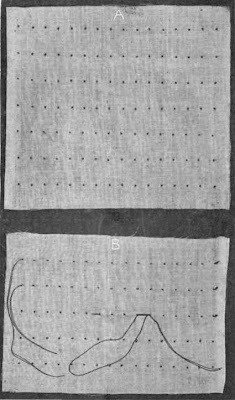 The final width of the apron is determined by two things: the stitches used, and the depth of the pleads. If you only use honeycomb stitch, my seventies craft manuals indicate that 1,5 or twice the length of fabric might be enough. Other smock stitches are less flexible, which means you probably need 2 or 3 times the length of fabric. (In my case, that would mean using about 200cm fabric for my apron, that's quit a lot). But, to make matters more complicated, the depth of the pleads is also important. The deeper the folds, the more fabric you will need. 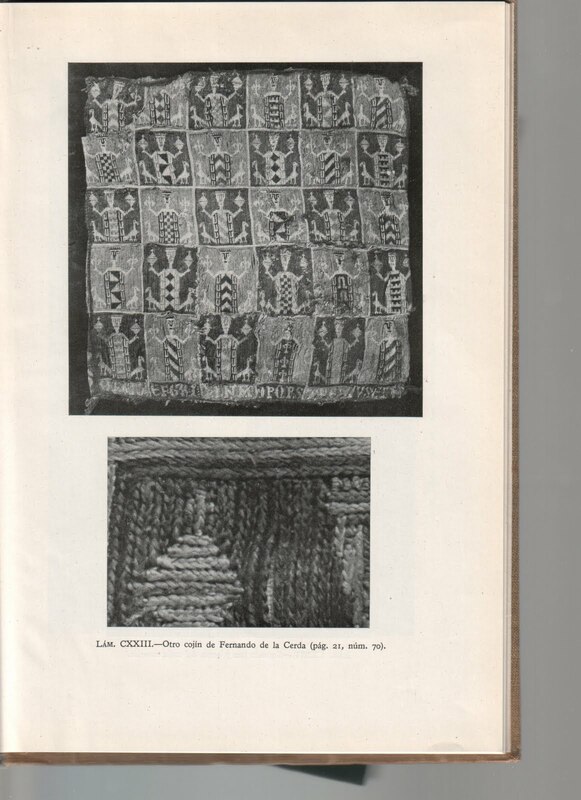 Image from Gomez-Moreno, M (1946), El panteon real de las Huelgas de Burgos, Madrid: Consejo superior de investigaciones cientificas, Instituto Diego Velazquez. 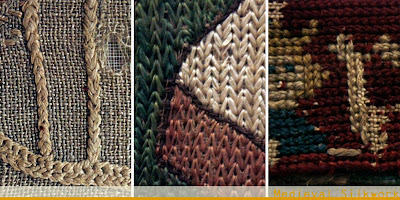 Images taken by me in November 2010 in the V&A textile study room. 1. Parts of a lectern-cover. The Annunciation, with angels censing, German, 14th century. 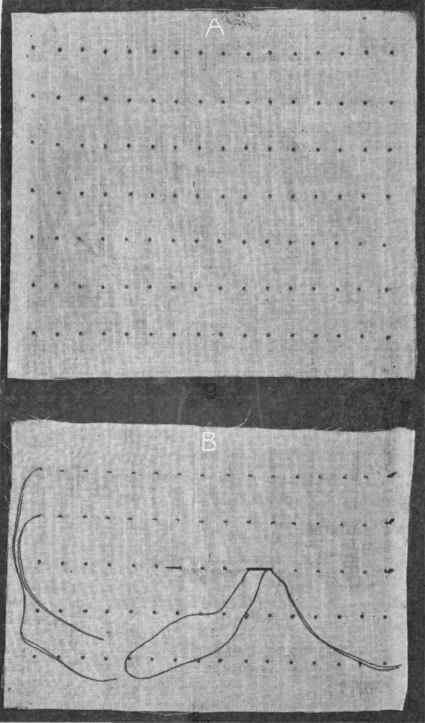 White linen thread in chain, split and buttonhole stitches on linen. From the Bock Collection. 7029-1860. 2. Panel. Adoration of the Kings. German, late 14th or early 15th century in brick and knitting stitches. From the Bock Collection. 8308-1863. 3. Apparel of an amice, with inscription SANCTA ODILLA SANCTUS KYLIANUS AVE REGINA CELO(UM) MATER REGIS. German, 15th century. Coloured silks in lon-armed cross stitch on linen. Said to come from the Cathedral of Halberstadt. From the Bock Collection. 8311-1863. Some time ago we had a discussion on the blog concerning the type of stitch used on some Spanish purses. Were they knitted or embroidered? 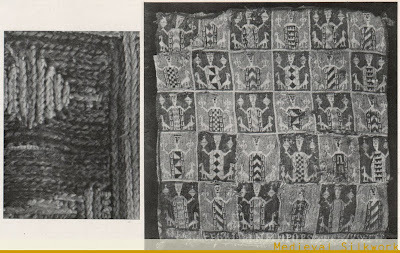 The pillow (also made in Spain) in the top image of this post pointed in the direction of embroidery: specifically the long-armed cross stitch. 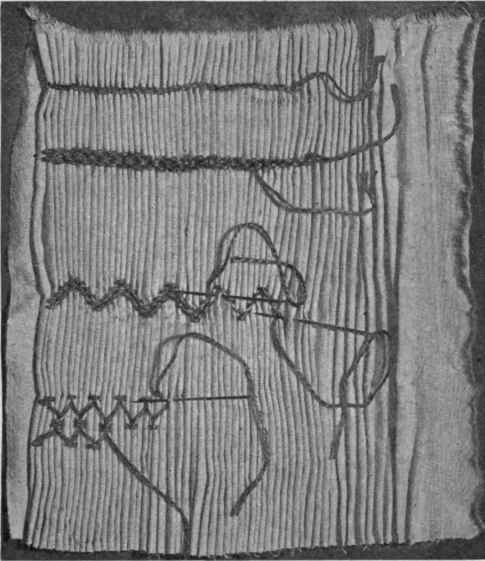 This stitch does slightly resemble knitting, and also explains some elements in the pattern that could not (or hardly) be achieved by knitting. When I was visiting the V&A museum in London last november I got the chance to study the embroidery collections up close. I was there to visit the first Fashioning the Early Modern workshop at the V&A but got some time to visit the collection as well. (Oh and do look at the photos of the workshop, there are pretty pics of fabulous pieces of knitting). I found several pieces containing stitches that resembled knitting. However, of all I found the type from image 3 comes closest. This also is a long armed cross stitch. When comparing it to the Spanish pillow it's almost identical. I have loads of other treasures to show you from my visit to London, but that will have to wait a little bit. I'll be posting them in portions as I have time available. Machteld already told you all that I have a new job. I started working as a phd researcher at Antwerp University on a project concerning the material culture of the Low Countries during the Long Sixteenth Century. I - oh lucky, lucky me - get to spend four years researching clothing, fashion and textiles of this period and region. 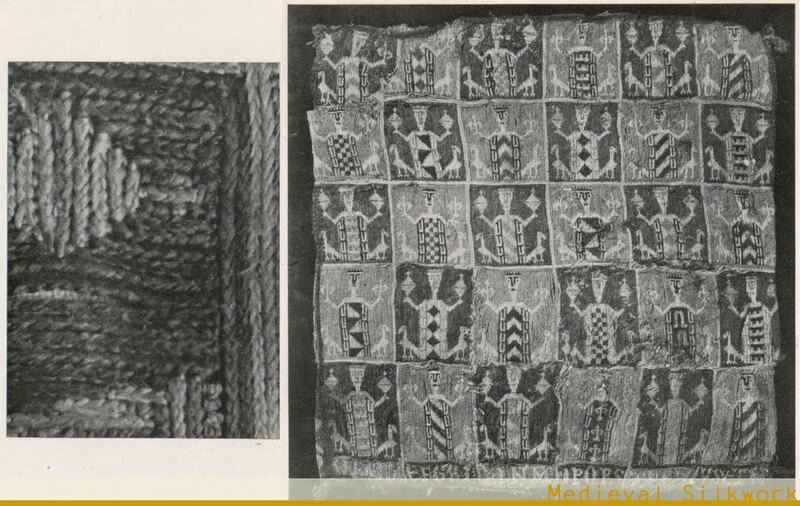 Mainly from a written sources perspective, but off course I'll also include visual sources and extant textiles. PS. : We recently reached 200 followers to this blog! Thank you all for being the best/coolest/sweetest followers in the world!